We had very mixed bag of weather this weekend and the April showers were never too far away! It was still nice in the sunshine that emerged in between, although it is supposed to get much colder this week;( I decided to wear my new light blue shirt yesterday while I could in case I’m dragging out the woollies again soon . 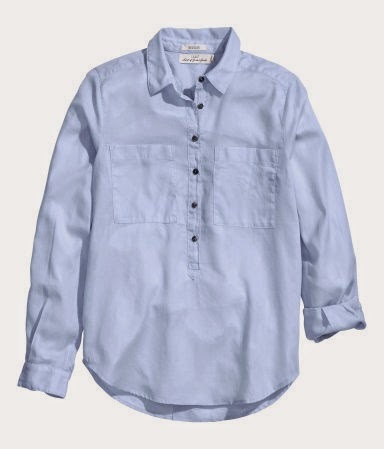 I love a casual shirt and had been looking for a light blue summery one- I spied this in Zara the other day and loved the simple collarless style. I hate shirts or blouses that are too fussy, so the light material and shape of this one appealed to me. It will be great for summer and could also be worn over a cotton dress or with a skirt for holiday time. Here it is styled on the Zara website with a suede skirt! I think basic shirts are a great wardrobe staple and something you can put on quickly in the morning with minimum effort required to look somewhat pulled together. As the rain was never too far away, my short Zara mac was a great standby. I have this style a few years and love it- I have seen lots of similar ones in the shops and have added a link to a very similar style and colour below if anyone is in need of a light spring mac:). I hope you all have a good week ahead:) Praying that cold weather gives us a miss! !